It is not uncommon for pets to experience discomfort caused by external parasites such as fleas, ticks, or mites on their skin or in their ears at some point in their lives. These parasites can be extremely irritating to pets and can cause serious skin problems or even carry disease. Modern medicines make treatment, control, and prevention of many external parasites much easier than in the past. ​Ticks are commonly thought of as insects, they are actually arachnids similar to scorpions, spiders and mites. Ticks are parasites that feed on the blood of their host, which can be an animal or a human. Ticks can only crawl; they cannot jump or fly. Some species of ticks will crawl several feet toward a host. They can be active on winter days if the ground temperatures are above 45 degrees Fahrenheit (7.2 degrees Celsius). 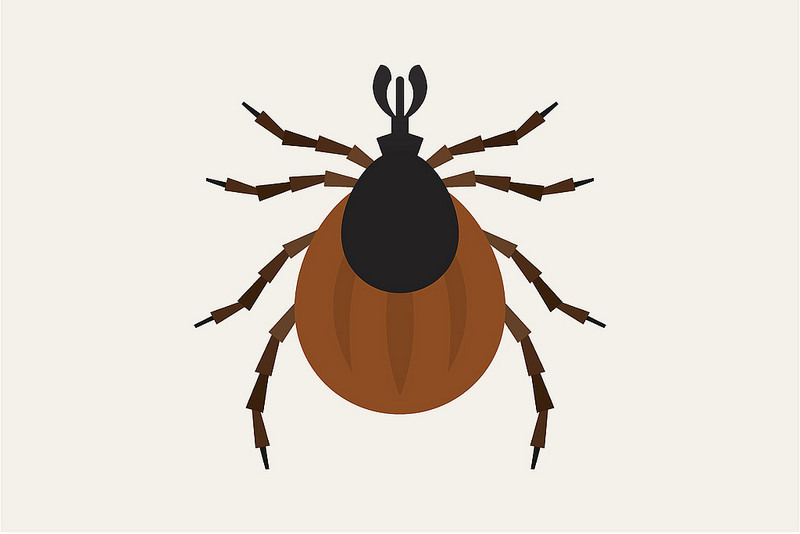 Ticks are efficient carriers of disease because they attach firmly when sucking blood, feed slowly and may go unnoticed for a considerable time while feeding. Ticks take several days to complete feeding. Unfortunately, it only takes 36-48 hours for them to spread disease. ​​Grasp the tick as close to the skin surface as possible. This reduces the possibility of the head detaching from the body upon removal. Pull the tick straight out with a steady, even pressure. Do not twist or jerk the tick as this may cause the mouthparts to break off and remain in the skin, increasing the chances of infection. Continue applying steady pressure even if the tick does not release immediately. It may take a minute or two of constant, slow pulling to cause the tick to release. After removing the tick, thoroughly disinfect the bite area and wash your hands with soap and water. DO NOT FOLLOW OLD WIVES' TALES - Home remedies such as applying petroleum jelly or grease, or touching the rear of the tick with a hot match do not work effectively and are not recommended. These techniques cause the tick to salivate and can actually increase the chance of getting a disease. Fleas are prevalent throughout the United States. Temperature and humidity extremes can kill them, but they can survive for long periods of time under a surprising range of conditions. Developing fleas can even become dormant for many months if there are no hosts available. If your pet spends time outdoors or around other animals (even the wildlife that passes through - rabbits, squirrels, other cats, coyotes, etc.) the risk of picking up fleas increases. However, even a completely indoor pet can become infested with fleas. We humans can bring fleas into our home on our clothing. Once fleas have entered a home, they can multiply very quickly under favorable year-round conditions, adding to the challenge of controlling them in a home environment. Once they have found a host they begin to feed immediately and lay a large number of eggs. Adult fleas may stay on your pet, but the eggs and larvae fall off and remain in the environment where they can hide in places like your carpeting, bedding, furniture, and baseboards. ​Ear mites are a very common problem in dogs and cats, particularly in puppies and kittens. The mites are very tiny, barely visible to the human eye, that live on the surface of ear canal skin in dogs and cats. An infestation produces brownish ear wax, similar in appearance to coffee grounds. Ear mites are contagious and can travel from the ears of an infected dog and cat to any other dogs and cats in close contact. Pets who are infected with ear mites typically have very itchy and irritated ears which they frequently scratch at or shake their heads. The ears can become red and inflamed, and rashes or other skin disorders can occur on the skin around the ears. Ear mites are transmitted though social interaction with other infected pets, which can include sleeping or playing together. Luckily, ear mites can be successfully treated with a number of medications. Because ear mites are contagious, all pets in the household (both dogs and cats) should be treated for ear mites. Your veterinarian can provide assistance in choosing the most effective treatment for your other pets. 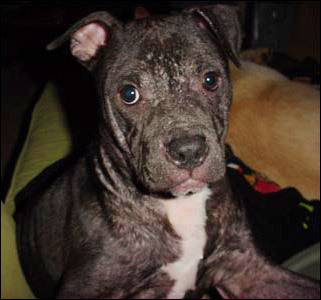 Scabies, also known as Sarcoptic mange, in dogs is caused by the Sarcoptes scabiei mite, a highly contagious skin parasite. The mites burrow into the skin and cause severe itching, which can result in the formation of scabs and hair loss. It is a nonseasonal parasite that can be found in dogs of all ages and breeds. Scabies causes severe itching, so dogs that experience prolonged scratching and hair loss are suspect. Symptoms are most often seen on the ear flaps, elbows, hocks, abdomen, and chest area. Scabies is difficult to diagnose so clinical signs and elimination of other risk factors are important as skin scrapings are often unreliable. Maintaining the good health of your dog is important to preventing scabies. Dogs that roam with other dogs, reside at a shelter/boarding facility, or have frequent contact with other dogs are more susceptible as scabies is easily transferred between dogs. Scabies is zoonotic (can be passed from animals to humans), so pet owners that have close contact with their dogs may develop an itchy rash also. After the dog has been treated, however, symptoms usually disappear.